These epic banana bread muffins are foolproof, soft and flavorful, with perfectly rounded dome tops. I’ve adapted them from my favorite banana bread recipe, and the results are everything I want in a muffin. They’re also incredibly fast and easy. You’re going to love these easy banana bread muffins! Trust me; just make them! 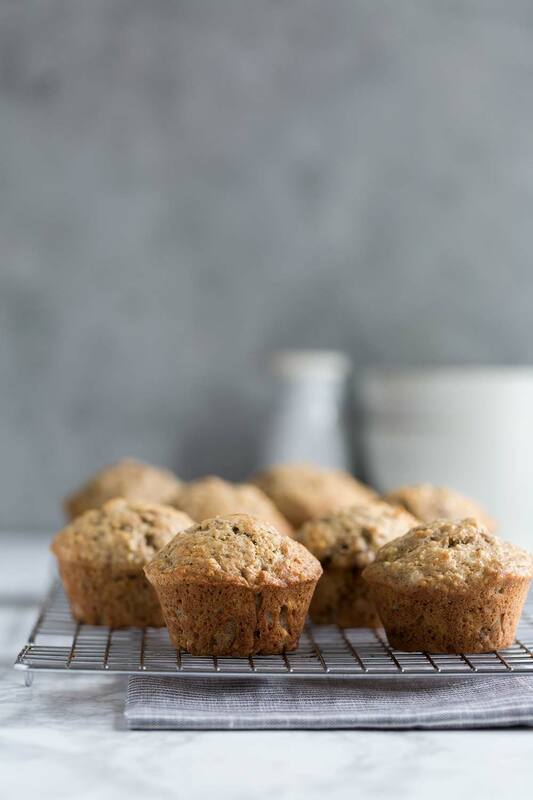 I never used to be a huge fan of banana bread, but let me tell you- I fell in love with these muffins the moment I tasted them. They’re soft, nutty, moist without being overly sweet or dense. I’ve gone on to make these many more times since that first batch, and I can safely say we are both hooked. Mash super ripe bananas in one bowl. Whisk together the dry ingredients in another bowl, followed by the wet ingredients in another. Combine the three, divide evenly among greased muffin tins. Bake! I adapted these muffins from a Cook’s Illustrated banana bread recipe. They have never let me down, and this time was no exception. 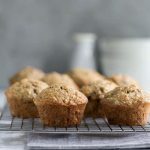 I love these so much that I’ve even gone one step further and created brown butter banana bread muffins If you like brown butter as much as I do, I highly recommend checking those out. I chop the walnuts very finely, both because I prefer less texture in the muffins, and because I think you get better flavor distribution that way. If you’re using raw nuts and need to toast them first, spread the walnuts in a thin layer on a baking sheet, and toast in a 350 degree F oven for around 5-7 minutes, shaking the pan once or twice, until fragrant. I always recommend weighing the flour over using a measuring cup. I used 10 ounces of flour. If you measure out two cups, it might be 8 ounces (or more/less). You can buy inexpensive kitchen scales on Amazon. So worth it. You can also read more about this in my post How to Measure Flour Correctly. I always use plain, full fat or part-skim yogurt in this recipe, but I’d imagine that sour cream works as well. However, I haven’t personally tried it yet. 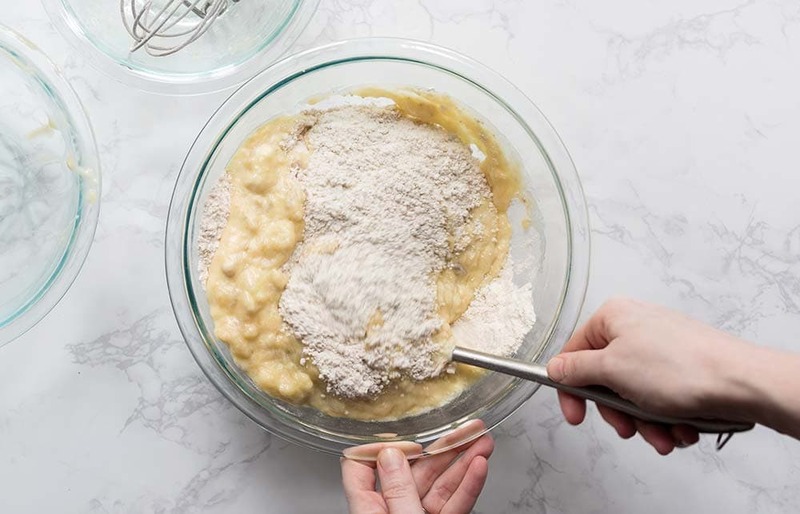 To store banana bread muffins, place them in an airtight container or sealed plastic bag, then store at room temperature for up to three days. Can You Freeze Banana Bread Muffins? Yes! To freeze, store the muffins in resealable freezer bags freeze for up to three months. 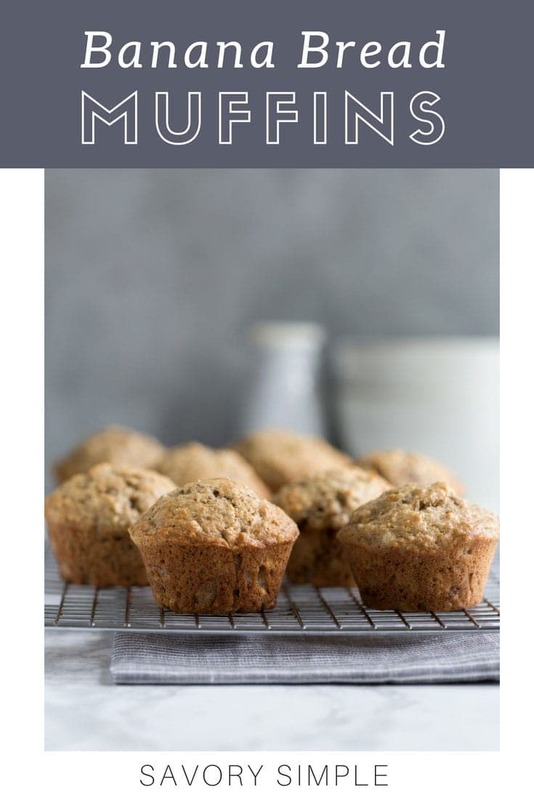 If you like these banana bread muffins, you may also enjoy my pumpkin muffins, cherry vanilla muffins, and stone fruit yogurt muffins! 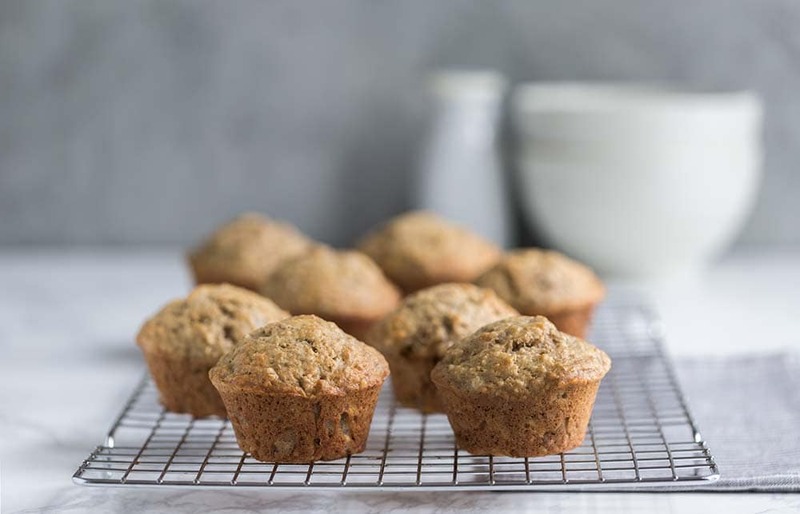 These banana bread muffins are a perfect breakfast for a lazy Sunday. Preheat the oven to 350 degrees F. Grease a 12-cup standard-size muffin tin. In a large bowl, whisk the flour, sugar, baking soda, salt and walnuts together. In a separate bowl, combine the bananas, yogurt, eggs, butter and vanilla. Fold the wet ingredients into the dry until just combined. 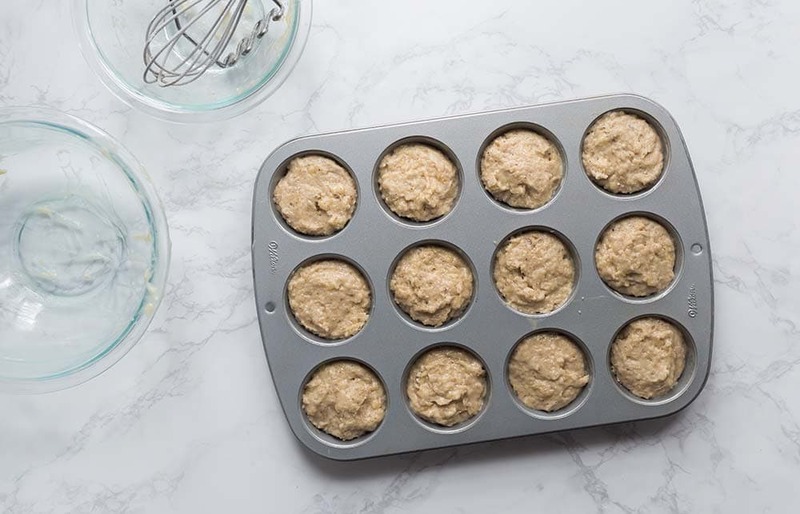 Scoop the batter evenly between the muffin tins. Bake until the muffins are golden brown on top, approximately 20-25 minutes. Serve warm or at room temperature. Store leftovers in an airtight container or sealed plastic bag at room temperature for up to three days. You can also freeze them in a freezer bag for up to three months. Adapted from The Best New Recipe by Cook's Illustrated Magazine. Read my post "How to Measure Flour" for the Scoop & Sweep Method. « Prawns vs. Shrimp: What’s the Difference? The best kind of muffins ever! Love your site in general. Thank you for sharing all your knowledge. Recipe sounds great. WIll try it and let you know. Pls specify if you are using a convection (fan) or conventional (traditional) oven. Pls try to mention this distincion at your recipes. It does make a difference. Thank you in advance. Hi Ersi, all of my recipes use a conventional oven. If a recipe doesn’t specify to use a convection oven, you should always assume it’s using a traditional oven. At least, that’s the case with US-based recipes; I’m not an expert in global standardizations, so I don’t want to misspeak there. For US-based recipes, this explains why you don’t see the type of oven specified on sites like Food Network, Cooks Illustrated, and Bon Appetit. I found this recipe years ago and have made it about once a month since! My kids love muffins and these are their favorites! We leave out the walnuts, and they are always gobbled up. Light, sweet, but not too sweet. Side note, they freeze great! Thank you, thank you!